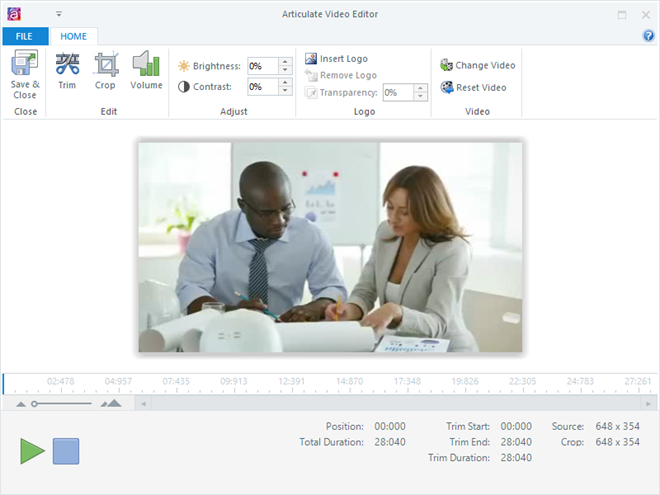 Articulate Storyline has a built-in video editor with several tools for improving embedded video content. 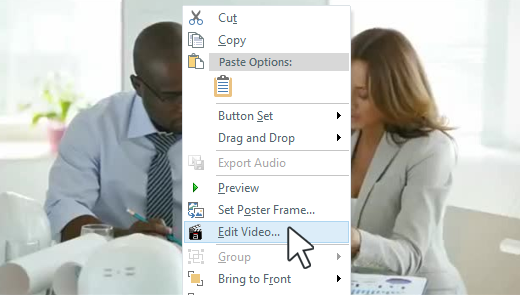 After adding a video, just right-click its placeholder on the slide and select Edit Video. SWF movies can't be edited in Storyline. You'll need to use third-party editing software, then import the edited file into Storyline again. Website videos (Screenr, YouTube, Vimeo, etc.) can't be edited in Storyline. Click the Trim button on the ribbon. Draggable markers will appear on the timeline below your video. Drag these markers to change the video's start and end points. As you drag the start and end points, keep an eye on the Trim Start, Trim End, and Trim Duration values in the lower right corner. These help you see exactly where the video will start/end and how long the trimmed version will be. If you change your mind and want to revert back to the video as it was when you first opened the video editor, click Reset Video. When you've finished editing your video, click Save & Close. 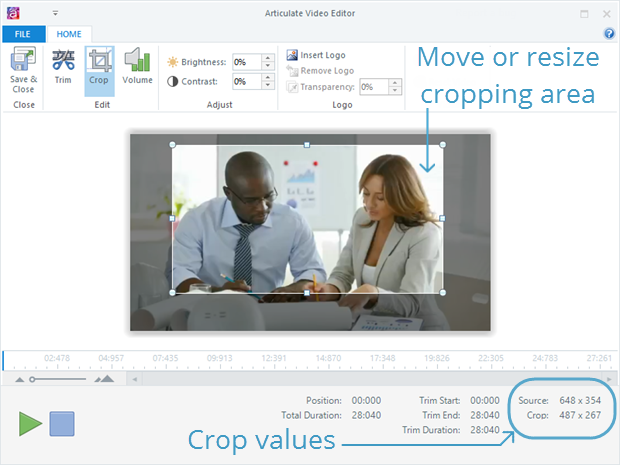 The cropping tool lets you change the width and/or height of your video. For example, you might want to crop out something that's distracting, or you might want to control the video's dimensions so it fits better in your course. Click the Crop button on the ribbon. A resizable cropping window is added to your video. Click the cropping window to reveal the sizing handles, then drag the borders of the rectangle to select the portion of the video you want to keep. If you want to maintain the original aspect ratio of your video, use the corner sizing handles. As you drag the cropping window, keep an eye on the Crop value in the lower right corner of the screen. 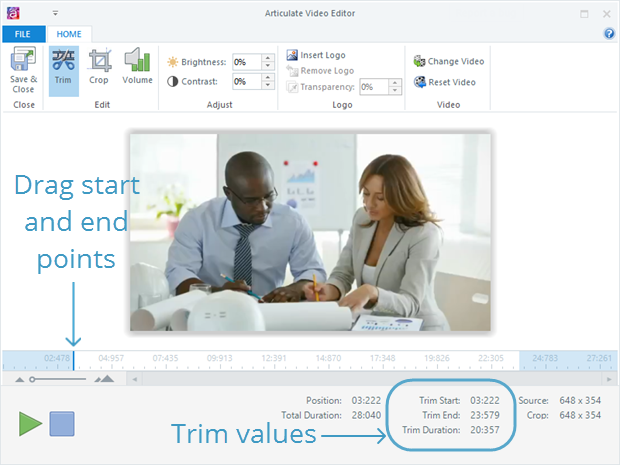 This helps you size the video to the exact dimensions you want. You can improve the quality of your video by increasing or decreasing the volume, and adjusting the brightness and contrast. To adjust the volume, click the Volume button on the ribbon, and use the slider to increase or decrease the percentage. You won’t be able to hear the volume adjustment until you click Save & Close. Click the Insert Logo button on the ribbon. Browse to the image you want to use as your logo or watermark, and click Open. If you want to add transparency for a watermark effect, enter a percentage in the Transparency field. If you change your mind and want to remove the image, click the Remove Logo button. Or, click Reset Video to revert back to the video as it was when you first opened the video editor. Note: You won't be able to see your logo when you preview the video in the video editor, but it'll show up when you preview or publish your overall course.